Carrot is an amazing root loaded with Vitamin A and beta carotene. The high level of beta-carotene acts as an antioxidant. It help slows down the aging of cells. Chewing on a piece of carrot after each meals helps in maintaining the healthy gums and teeth. Black pepper aids digestion, and adding black pepper to the diet helps to relieve the congestion. It reduces inflammation. 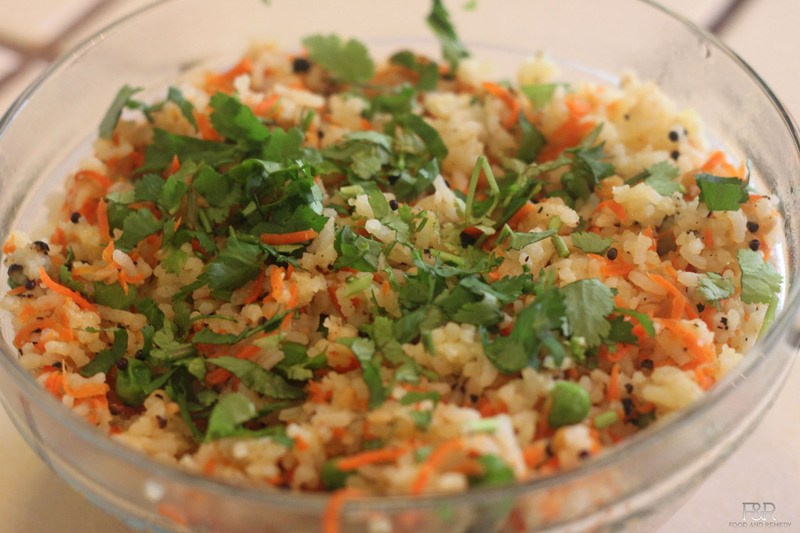 Here is a very simple, quick recipe using the carrots and Pepper. First keep the cooked rice ready. Heat the oil in a pan. Once the oil is hot enough, add mustard seeds. Then add channa dal, and urad dal. Fry this until dal turns a golden brown color. Now add curry leaves, carrots, peas and salt. Mix well and cover the pan. Let it cook for 2 minutes. Add the cooked rice and gently mix it. Now add pepper powder and mix. Reduce the heat and let it cook for a minute, then turn off the heat. Now the Carrot pepper rice is ready to serve. Thanks Arathi, Glad you liked it!